Capcom has now revealed Resident Evil 7’s collector’s edition and fans are going to love this one. 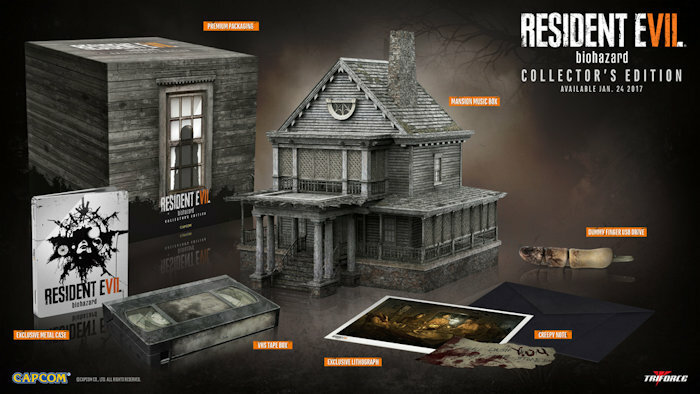 It will cost you $180, but that’s because this special collector’s edition will get you six unique items, including your very own Resident Evil mansion. This is a highly detailed eight-inch model based on the one in the game, but this replica mansion has its own speakers and LEDs too. Making this edition truly special indeed. It looks pretty awesome. The mansion alone is enough for fans to jump on this special edition. But wait, there’s much more here. This special edition will also include an exclusive metal case, a grimy-looking VHS box, a bloody finger-shaped USB stick, an exclusive lithograph and a creepy note. You are really paying for the mansion with this edition, the rest are just extras. It is the mansion that players of this game will want for their desk or shelf. Resident Evil has been popular ever since the release of the first game and fans keep coming back for every game. While Resident Evil 7 will be heading to PlayStation 4, Xbox One and PC on January 24th, this collector’s edition will only be available for consoles. Sorry PC players.